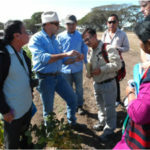 Effective engagement between research and extension staff and farmers is critical to the success of many agricultural research projects in Australia and developing countries alike. To help with the successful establishment and monitoring of on-farm demonstration trials of new climate change adaptation strategies for ACIAR projects being led by CSIRO in Lao PDR, Cambodia and India, the Crawford Fund recently supported extension training in Australia for Mr Sipaseuth, Mr Khammone Thiravong and Mr Pasalath Khounsy from Lao PDR; Dr Minea Mao and Mr Tom Say from Cambodia and Ms Bhagya Laxmi from India. 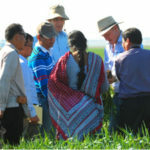 The aim of the training course, organised by Alison Laing and Christian Roth from CSIRO, was to introduce participants to different examples of extension practices – including government, private and non-profit services – and to broaden their knowledge and awareness of simple crop management tools used by farmers and extension practitioners in Australia. In the first week participants were exposed to three private extension agencies through on-farm visits in the Burdekin and on the Darling Downs in Queensland, and to government extension and support for emerging primary industries. They also learned about methods of participatory action research and were introduced to the value of simulation modeling at CSIRO. In the second week they engaged with State government and non-profit extension agencies, visiting dryland Mallee farms in SA and Victoria and talked with farmers about the challenges of marginal Australian environments. 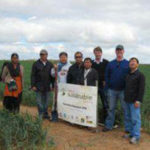 The participants came to understand that Australian farmers face a range of challenges and opportunities, and that in many instances these are similar in nature, although different in size, to challenges faced by farmers in India, Cambodia and Lao PDR. The upcoming Crawford Fund film visit to Cambodia with documentary maker Sally Ingleton will be covering the Cambodia project and hopes to talk with Dr Mao. “The knowledge and experiences which I gained from my two week training course in Australia will help me to promote and improve agricultural extension systems in my country. I do hope that the appropriate extension approach can be applied in the future. I am going to share my experiences and knowledge to my colleges in order to strengthen their capacity and effectiveness,” Dr Mao said.